The most superior point of this software is to be able to get the knowledge easily the temperature durling metal cutting processes. The cutting temparature is one of the very important factores for hight efficient machinning. Because the tool wear or tool fracture depend strongly on the temperature. But it is very difficult to know the temperature distribution by experimental methods. 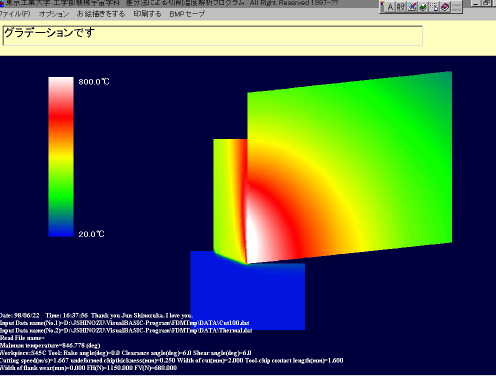 Accordingly the numerical simulation is very effective. 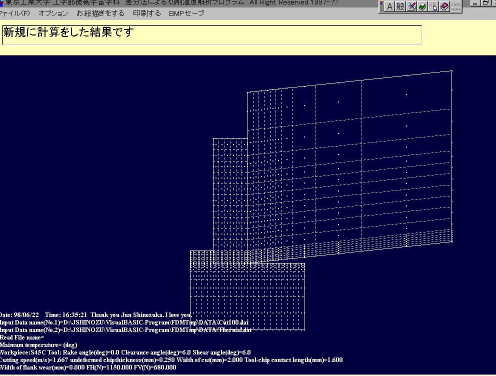 This software runs on Windows 95, source code is written by Visual Basic. The calclulation time is very short. It takes about one minute ( CPU ; Pentiun 130 MHz, Memory ; EDO-32MB). Before you try to develop the newly cutting conditions or cutting tool. 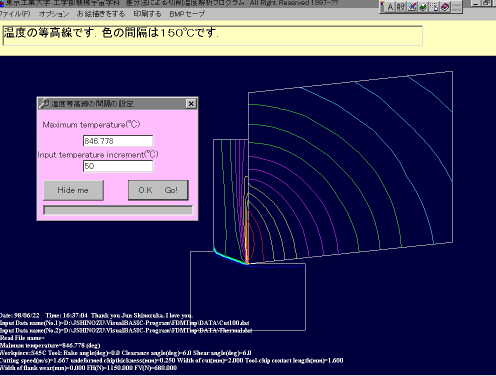 You want to try to study how to calculate the temperature by Finite Difference Method. e.t.c. At first step you must open the input data file. 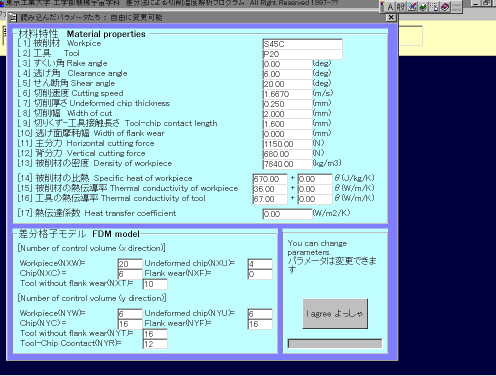 The tool geometry, cutting conditions, cutting forces and thermal properties have to be written in this data file. Ofcourse, you can change each data in this dialogue. 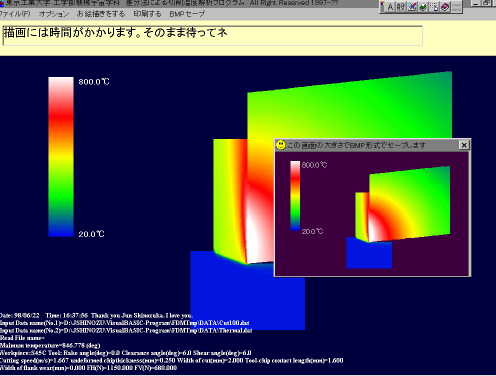 When the input datas are satisfied, the FDM mesh is shown. You can also change the mesh by changing the input data file. When the input datas are satisfied, the calcluation starts. The calculation will repeat until the results are converged. 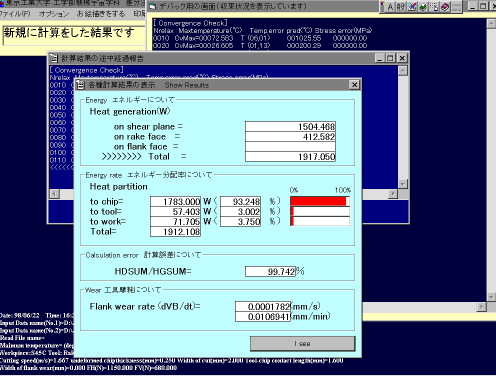 When the calculation finishes, the energy distribution ratio is shown. In short, the degree for the tool and for the workpiece. The contour line can be shown. Beautiful 256 colors gradation can be shown. The mesh, contour line and gradation representation can be printed out by Windows API (printer function). And more over, these figure can be saved as BMP files. This function is very usuful.